In the far away kingdom of Dor… lived a brave and virtuous mouse with comically oversized ears who dreamt of becoming a Knight. Banished from his home for having such lofty ambitions, Despereaux sets off on an amazing adventure with his good-hearted rat friend, Roscuro, who leads him, at long last, on a very noble quest to rescue an endangered princess and save an entire kingdom from darkness. Get ready for an all-new animated classic that families will enjoy together for years to come! In The Tale of Despereaux, the world’s bravest mouse embarks on a noble quest that leads to discovery, courage, honor and ultimately redemption. Journey along with Despereaux as he encounters an unforgettable group of colorful characters and learns about life’s important messages in this charming and fun-filled story. Based on the heartwarming children’s best selling book and featuring the incredible voice talents of Matthew Broderick, Emma Watson, Dustin Hoffman, Sigourney Weaver, Kevin Kline, William H. Macy, Tracy Ullman, and Stanley Tucci, The Tale of Despereaux has something for everyone – excitement, adventure, and a hero for boys, a princess and a love story for girls, fun and entertainment for adults and kids alike! For people of all ages, this is a timeless story about finding one’s place in the world. Available April 7, 2009! This is a delightful movie! My three kids (ages 2, 5, and 6) have watched it several times since we got it in the mail a few days ago. My son Aiden says his favourite part of the movie is "the sword fights (insert 6 year old jumping around imitating said sword fights here)" and "the saving part when they save the princess". Owen says his favourite part of the movie is "the sword fights" (of course) and "the cat that tries to eat the mice (insert 5 year old maniacal laughter here)". 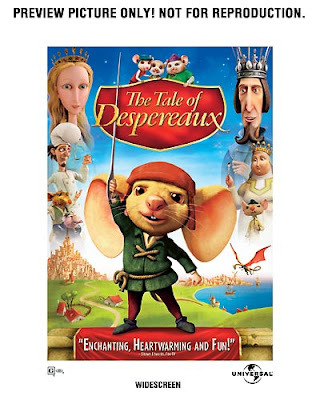 We watch a lot of animated kids shows around here and some of them are SUPER annoying to anyone over the age of 7... but I found The Tale of Despereaux to be quite enjoyable. Wonderful graphics, vibrant colours, family friendly story-line, all makes this film perfect for anyone with kids! This movie has a great message to. One of my favourite lines comes near the end when the narrarator says "A single act of forgivness can change everything". Seriously, how true is that!! Any movie that can help me get the importance of forgiveness accross to my kids is a winner with me. Thanks for posting this, I've been wondering if this was one of those movies that was just awful to be forced to sit through. I think we will give it a try now!